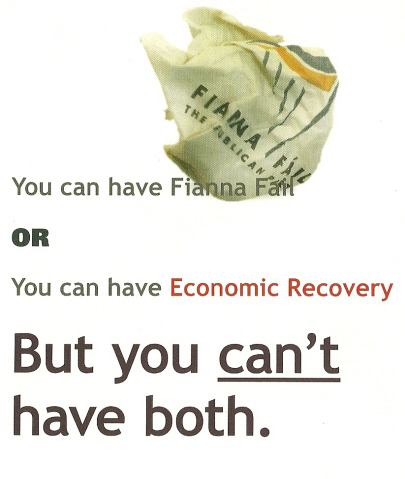 From the 2009 Local Elections a leaflet from former TD Eric Byrne with the headline “You can have Fianna Fail or You can have Economic Recovery.. But You Cant Have Both.” Byrne, running in Crumlin Kimmage was easily elected, topping the poll with over 1.25 quotas. Byrne will be on the Labour ticket in Dublin South Central in the forthcoming Election. Interesting how small the Labour logo was. Most Labour candidates have a photo of Gilmore and a huge Labour logo and little else. Interesting how he didn’t go down that route. 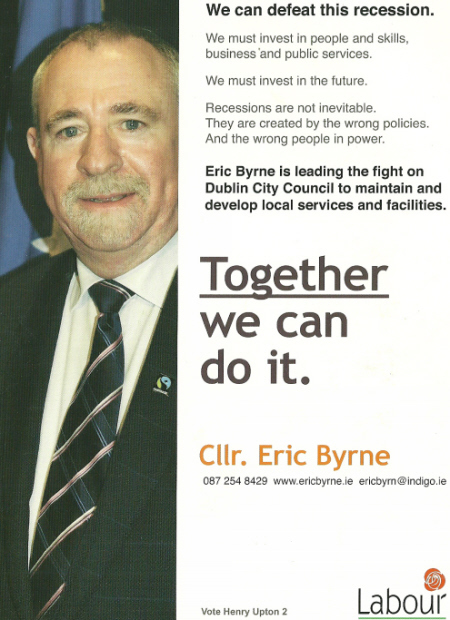 I suppose the fact that Byrne would be well established would negate the need to have Gilmore all over his leaflets.